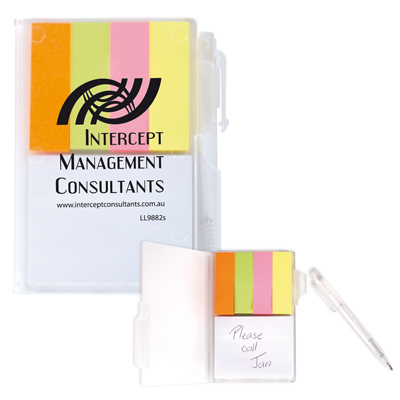 1 notepad and 4 coloured note flags in clear pocket size notebook with pen. Price includes 1 colour 1 print. COLOURS: Clear with Orange, Green, Pink and Yellow note flags. PRINT AREA: 55mmL x 80mmH. ITEM SIZE: 175mmL x 105mmH.